Halwani, M & Batwai, R. A Case of Meningitis Caused by Salmonella Paratyphi Type B in a Four Months-Old Infant. (2016) Clin Trials Pathol Case Stud 1(1): 26- 28. © 2016 Halwani, M.A. This is an Open access article distributed under the terms of Creative Commons Attribution 4.0 International License. A four-month year old Burmese infant was seen in the Emergency Room (ER) of the Maternity & Children Hospital in Makah, Saudi Arabia with a clear clinical picture of meningitis. He was put empirically on antibiotics and full investigations were done. A Cerebral Spinal Fluid (CSF) was collected and the culture result later revealed Salmonella paratyphi type B from his CSF. The infant did not improve and he developed extra-axial subdural collections at the fronto-parietal regions. He stayed critically ill for 48 hours until a full evacuation of the accumulated collection from his head was done. The antibiotics were adjusted based on the new sensitivity results obtained and the infant responded to the treatment. His mother admitted that she prepared his bottled milk using tap water and she claimed that she did not know that this could hurt her child. Two weeks later post operation his condition improved and he was discharged from the hospital. The World Health Organization warns about the water contamination by Salmonella paratyphi. However, the involvement of this serotype in particular is not reported widely with only a few reports being published. 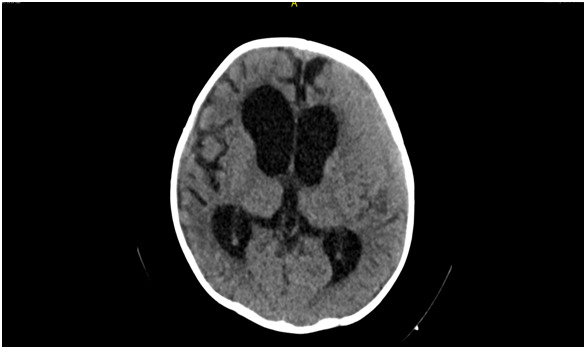 A Salmonella paratyphi clinical involvement usually includes other infections such as bacteraemia; however, in rare cases, it can reach the meninges and cause meningitis. This is a very serious condition and can lead to death especially in infants if it is not treated quickly with proper antibiotics[2-4]. A four month old Burmese infant was admitted to the ER of the Maternity & Children Hospital suffering from fever (38.6°C), loss of appetite, 4 episodes of focal seizure in one day with no diarrhoea or vomiting. He was also lethargic with a heart rate of 168/min and blood pressure of 104/43 mmHg. A complete blood count was ordered immediately and the results were: WBCs: 8.82, N: 50.6%, Hbg: 8.8 g/dl, and Platelets: 169000 mcL. Brain CT showed: subdural hygroma. A CSF sample was collected and the results were Glucose: 0.02 mmol/L and protein: 286 mg/dl. The baby was put on ceftriaxone IV 100 mg/ kg empirically, but he remained febrile and unwell clinically for another 48 hours. Vancomycin was added but with no remarkable improvement. The microbiology report of the CSF came back positive for Salmonella which was then fully identified to be S. paratyphi B that was sensitive to ceftazidime, ceftriaxone, cefepime, piperacillin/tazobactam, imipenem, trimethoprim/sulfamethoxazole, and colistin. On the 4th day post admission the baby developed a high grade fever (39.7°C) associated with frequent brief abnormal movements. His blood culture came back positive with the same organism. A brain CT was performed the next day and showed bilateral extra-axial subdural collections in the fronto-parietal regions (Figure 1). The baby was taken to the operation room and external ventricular drainage was placed for evacuation where a milky collection was drained and then sent for culture. The microbiology results identified the same organism with the same reported sensitivity. However, before the lab results were released, ceftriaxone was replaced with imipenem while vancomycin was discontinued and piperacillin/tazobactam was added. Soon after, the baby’s fever started to go down and his temperature became normal 48 h after the operation and two days later, the drain was removed. 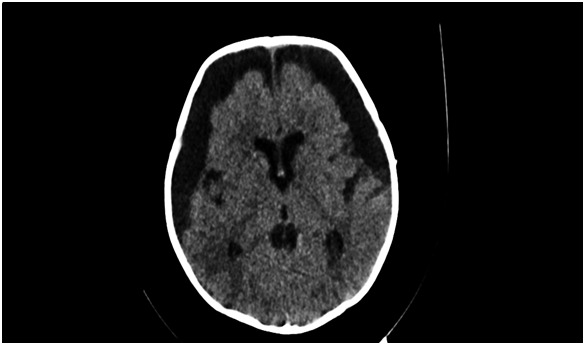 The brain CT was repeated a week later showing remarkable improvement compared to the previous one (Figure 2). The infant completely recovered two weeks post operation. The mother was interviewed regarding the baby’s feeding and she claimed that she used tap water to make his bottled milk whenever she did not have enough milk to breastfeed. There are no reliable sources to our knowledge that discuss the Burmese situation in Makah, Saudi Arabia. However, what is there all seems to suggest that they are a small minority with the estimates being inconsistent between the different sources but agreeing on the fact that the Burmese live peacefully within the local community but some without legal residence (they come during Hajj season but they do not return back to their country). So it is of no surprise that their disposition, their socioeconomic status, educational levels, and hygiene background is far from standard. This explains why the 32-yearold mother of this infant unintentionally harmed her baby. The mother, who feed her baby bottled milk when she does not have enough breast milk, claims she only warms-up the water before using it never boiling it. The mother was not aware that tap water could carry any problems that could lead to the illness of her child. A literature search found a few scattered reports about Salmonella Meningitis[3,4] since it was firstly reported in the late fifties. Meningitis due to Salmonella infection can happen in newborns and infants due to hematogenous dissemination of the organism from another site of the body to the Central Nervous System. As mentioned earlier and in spite of the rarity of Salmonella paratyphi-B meningitis, a similar case was found in the literature. The acquisition of the organism in the latter study was a result of consuming skimmed milk contaminated with Salmonella paratyphi-B. The source however of the contamination was not determined in the study and the authors put the blame on the socioeconomic condition and the poor hygienic practice of the family. The source of contamination in our study might not be remarkably different from the contamination of skimmed milk as both are likely to be the consequence of poor hygiene practices. Using tap water to prepare bottled milk is most probably the main cause of the dilemma in this study. Tap water was identified before as a source Salmonella infection. Another argument could be that the infant’s acquisition of the organism was due to the mother’s previous infection with Salmonella paratyphi-B that might put her in “a carrier state” of the organism. However, the mother denied that she experienced any gastrointestinal symptoms on a short term and no attempt was made to take a stool culture from her for further investigation. The act of using tap water to prepare bottled milk should never be practiced. This act can lead to a serious illness that can be lethal especially in infants, if not treated fast with the proper antibiotics. Mothers who just have their babies delivered should be instructed by their healthcare providers not to use tap water under any circumstances to prepare their babies bottled milk. It might be wise to say that hospitals should have a simple booklet or printed guide that explains safe bottle feeding. The booklet should be supported with clear instructions and coloured pictures. Such booklets can be given to the mothers to use before discharge from the hospital, or upon their post-delivery follow-up visits even if the delivery was not in the same hospital. Moreover, these booklets should be available in Arabic, English, Burmese and other languages depending on what is widely spoken in that area. They should also be available both in print and online. Salmonella paratyphi can be acquired from tap water if it was used to prepare bottled milk. The consequences might be serious especially in infants. Mothers who use bottled milk should be instructed by their healthcare providers to avoid using tap water in preparing bottled milk. 1. WHO, Salmonella (non-typhoidal). (2013) World Health Organisation. 2. Pratibha, Bhat., Meena, Dias., Roopa, Hegde., et al. Salmonella Paratyphi B septicemia in a Neonate. (2013) J Clin Neonatol 2(2): 93–94. 3. Elias, Makhoul., Charbel, Yazbeck., Anthony, Zaarour., et al. Acute pancreatitis and aseptic meningitis: Rare complications of Salmonella paratyphi infection. ( 2015) Arab J Gastroenterol 16(1): 29-30. 4. Cohen, J.I., Bartlett, J.A., Correy, G.R. Extraintestinal manifestations of Salmonella infection. (1987) Medicine 66(5): 349–88. 5. Kenneth, C.W. Salmonella meningitis. (1958) Arch Dis Child 33: 171–175. 6. Dharsandia, Milan, R., Soni, Sumeeta, T., Vegad, Mahendra, M. Salmonella paratyphi-B meningitis, isolated from CSF. (2010) 1(4). 7. Suthienkul, O., Siripanichgon, K., Promachot, P. Bacterial contamination of bottle milk in infants under 6 months in Children's Hospital, Bangkok, Thailand. (1999) Southeast Asian J Trop Med Public Health 30(4): 770-775. 8. Mermin, J.H., Villar, R., Carpenter, J. A massive epidemic of multidrug-resistant typhoid fever in Tajikistan associated with consumption of municipal water. J Infect Dis 179(6): 1416-1422.